Rotterdam Routes is an initiative of the city of Rotterdam, the Netherlands. With Rotterdam Routes you get to know Rotterdam on a whole new level. While walking you'll hear and learn from a real Rotterdam local. All routes contain audio and help you navigate turn-by-turn along all the nice spots the city has to offer. The app is free to download on the App Store and Google Play. For visitors of the exhibition 'Living Dinosaurs' in the old post office of Rotterdam and dinosaurs enthusiasts we designed and developed the Living Dinosaurs app. The app contains information about the dinosaurs present at the exhibition and gives visitors the possibility to take part of an interactive quest. Using iBeacons (small Bluetooth-beacons that can precicely pinpoint the location of visitors) you can complete the quest while searching for dinosaurs and answer questions. At the end of the quest you'll receive a nice present. You can download the app for free on the App Store and Google Play. 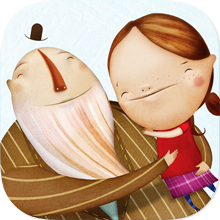 Land of Mislaid is an interactive children's book for iPad where little Hannah and her grandfather explore the living room, searching for Hannah's lost peppermint. Each page represents a part of the living room where children can explore fun animations and sounds by tapping different elements. The book has text-only and narrator options.